Home / American Crafts / Yay! It’s Janeuary! Queue the disco music, get the mirror ball spinning, release the balloons! I have a reveal of my full range in the videos – Ta-Dah! Let’s celebrate with a GIVEAWAY!!! Yes! To enter, all you need do is subscribe to the site ( see the sidebar) and then watch the 38 second PREVIEWS of my collection. Each one has different music. Let me know your favourite music AND why in comments section at the bottom of this blog post (Let me know the the art supplies that catch your attention too!). So here are the 38 second preview videos for you to vote on! Thank you to Jordan at American Crafts who created the fantastic video and to the artists who have created the music I have used here under licence. I hope you enjoy the previews! 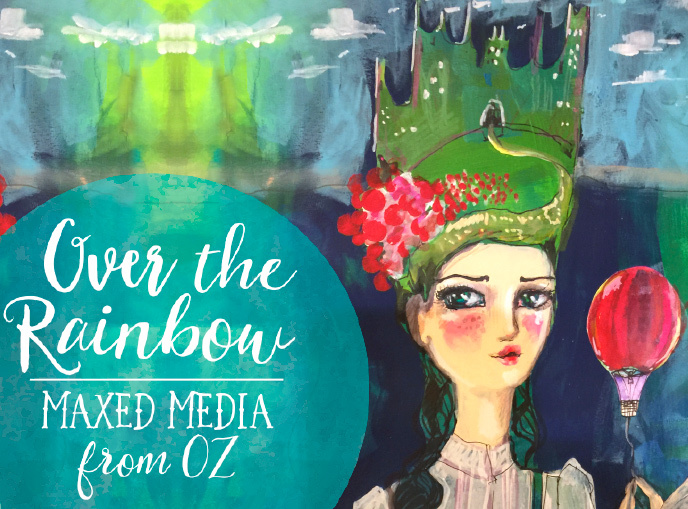 How about a Scholarship to my next Workshop, ‘Over the Rainbow’ where I will be showing techniques featuring my Mixed Media line! On my Instagram and Facebook pages I am sharing images that have been posted of my Mixed Media art supplies Collection starting it’s set-up phase in Michaels stores across the USA and Canada. So while the magic goodies are traveling to Michaels and into my web store, we can have some fun! Tinsel ( my doglette) will draw the winner on Friday! I may have missed the drawing, but my favorite intro is “Believe In It”. I love that one. I am so excited about your products, I can hardly wait for them to reach the store. Thanks for sharing!! Believe in It! Can’t wait to try the new products! Love the harmony in “believe in it” look forward to trying out your neutral and flesh toned paints and the mermaid markers. I really love them all..(Fashion just doesn’t do it for me!) they are mostly reflective of you Jane…..up, bouncy and positive…..but I really think Happy Girls sort of says it all about your arty life…you have made a LOT of Happy Girls…….probably guys too but I don’t know them. xoxo The supplies are just fantastic…..I was expecting spectacular (knowing you) but this range even surpassed my imagination…….LOVE these supplies, and the packaging…I’d buy the pencils just to get that tin xoxo Oh the Washi tapes…I’ll have to have some of them….the serviettes….the Journal with one of your beautiful faces…..the collage papers…I don’t know where to stop this rave….I love it all. I love “the dreamer In me” for the happy message. I would have to say Colour Your Life because that’s what you are all about Jane. It’s all about the colour. Without colour in our lives it would be pretty boring to look at lol. Now the supply that stands out to me the most is all the washi tape but I have say I want two of everything because I would put one set in the vault and use one set hehehe. Congratulations Jane you did good hun. I think Fashion was great! It fit the flow of the video really well. I liked fashion best. It was modern but not overpowering. As far as the supplies, I already grabbed the ink brushes and pencils, so I guess I’ll hose are my favorites, but I’m intrigued by the white Washi. “Dreamer in Me” I sent my firstborn choice, but “Happy Girl” was a close second. Wow, congratulations – the video is great ! I love them all – one for all moods and times of the day and night! However, Happy Girls gets my first vote, closely followed by We’re Going up. We’re Going Up is perfect!! The soothing, yet upbeat music along with the lyrics are just right!! I love it!! If I had to choose a runner up it would be The Dreamer in Me!! Love the new line and I’ve already bought almost all of it at Michael’s yesterday!!!! I just love the Happy Girls track, it is upbeat and fun, fitting your personality (and colourful products) perfectly. But the lyrics of The Dreamer in Me got me – they are beautiful and I want to hear more of the song that goes with that tiny clip. I’m a real lyrics girl so while the music has to sound right so do the words. As to fav product – where do I start & how much time to you have? 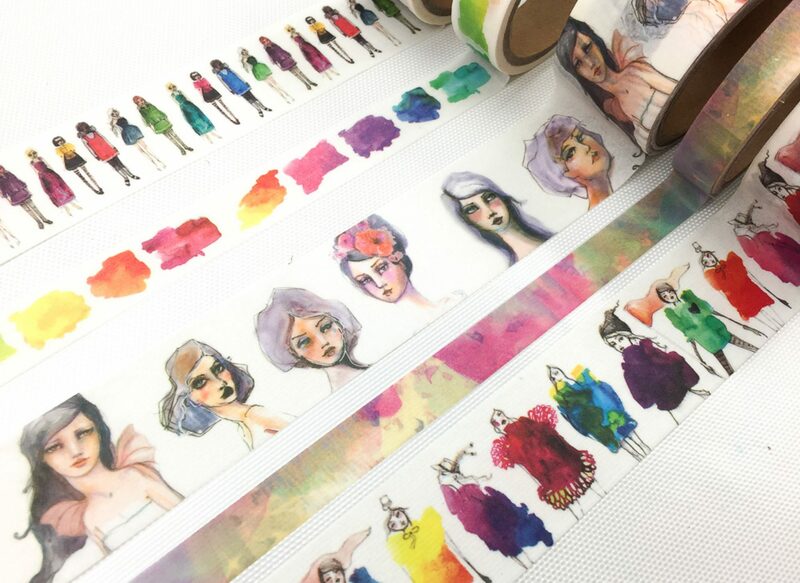 Watercolours, paints, mermaid wands & washi bits are top of my list. I love Happy Girls & Going Up! They both make me feel joyful and happy 🙂 The supplies made it to my Michael’s today!! I just had to go get some! The only sad part is that I can’t buy them all! I’ll be posting some IG pics and vidoes (jessicasandersart), and doing an unboxing and play time with supplies on my YT Channel. I can hardly wait!! It would be amazing to get a scholoarship to OZ, too!! Thanks for the opportunity, Jane!! I loved “We’re going up” the combination of the words and the voice just lend a relaxed feel to creativity and you are always telling us to “Relax” into the process. Just Believe in It is stuck in my head now! The Watercolor Brushes and the Flesh tone paint are on my want list! “Belive in it” is my favourite… not only because of the fitting song… we all have these moments, we think, we can´t make it… and this song is the answer.. we could, if we just belive… and IO think this song is perfect for all kind of “artsy people” – we could play big, we could create these thing… if we “just” belive in it. I prefer Fashion. I like that there aren’t any lyrics competing for my attention… just pure visual candy. I love that the beginning of the music seems to ramp up in intensity and creates a sense of anticipation. Definitively “Happy Girls”. This is exakt the kind of music which sparkles directly into my heart and continue bubbling through my whole body, into my fingertips, leading them to grab some pencils and wonna play. It’s exakt that kind of music, I immediately connect with you, Jane. It reminds me of all the good stuff I learn in your lessons and the fun you bring into my life. So to say: I’m reacting to this music like an artistic pavlov dog, which I find very funny and uplifting and often helpful kickstarting. Congratulations from Germany! We’re going up is my favorite of the bunch! It makes me want to grab all the supplies and create create create, with a little happy dance thrown in. Also, I saw I it on tv it would make me want to run to the nearest michaels to grab all the supplies my hands could carry. It also feels authentic to the whimsical way you run your classes! I’m most excited about the brights watercolor palette and the mermaid markers. I can’t wait to try everything!!! I really loved Fashon and Dreamer in me! And I think I’m most excited for the magic wands. Good skin tones are so hard to find! Can’t wait! How exciting! Dreamer in me is definitely my favorite, and so excited for the watercolor paints! I already own the Peerless Jane Davenport paints and hoping these meet that quality (but certain they will). HAPPY JANEUARY!!! “The Dreamer in Me” is a beautiful song that affirms that dreams do come true with the right person taking your hand and being your guide. The dream of being an artist comes true with Jane taking your hand and being your guide. I love all the products – but those magic wands just enchant me! WE’RE GOING UP — It is positive, love the lyrics and the upbeat tempo… it reminds me of YOU, Jane Davenport! Congratulations!! I’ve been to my Michaels 3 times already in anticipation of them getting your new line!! Any day now!! Color your life is my favorite! Upbeat, happy and something I’d listen to while painting! Which I will be doing here shortly now that I just ran out and purchased your inkredible pen and mermaid markers! I absolutely love your style and how approachable you make drawing and art in general! Thanks for all the inspiration!